This report documents how education “quarterbacks” (formerly known as harbormasters) have supported governance reform in three cities, and why and how they were effective. This exploration of why districts need governance reform and how to catalyze and implement it focuses on the following questions: (1) Why did the education quarterbacks in these cities take the steps they did? (2) How did those actions ultimately lead to and support a new governance structure? (3) What lessons can other city-based education organizations take from their pioneering experiences? The report identifies eight actions consistently observed among the three profiled quarterbacks: The Mind Trust (Indianapolis), Empower Schools (Springfield), and New Schools for New Orleans. Although the conditions, people, and steps are specific to each city, all three education quarterbacks performed most, if not all, of these actions to catalyze governance reform and support successful implementation. In one of the nation’s largest school districts, Clark County, Nevada, which includes Las Vegas, far too many students—especially particularly poor and minority students—lack access to a high-quality school. But recent improvements to the state’s charter policy create an opening for Clark County to use charter schools to transform educational options for all students, especially those who need them most. This report for Opportunity 180 shows why Clark County needs high-quality school options: A largely middling spectrum of school options tends to better serve students in wealthier neighborhoods, while poor and minority students in “quality school deserts” have fewer and poorer options. This report outlines what students and residents have to gain by improving school quality and lays out the steps policymakers and practitioners can take to overcome resource challenges that impede the growth of high-quality charters. 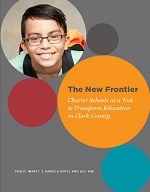 As the report concludes, Clark County will need to create the will that drives ongoing commitment to change policies, then provide the resources needed to grow high-quality charter schools and transform education for all students. From 2010 to 2015, Tennessee’s charter sector grew from 29 schools serving 5,500 students to 98 schools and 29,000 students, including 24 multi-school networks operating in the state. This report describes how the convergence of favorable policy conditions, political leadership, and public-private grants accelerated the growth of high-quality charter schools committed to underserved communities in Memphis and Nashville. The report also examines strategies that the Tennessee Charter School Incubator and the Charter School Growth Fund used to identify and develop promising new school leaders and to start and expand high-performing charter organizations. The Tennessee story provides a lesson for education leaders in how to create the conditions conducive to growing a high-quality charter sector. Charter schools are well positioned to serve the needs of English Learner (EL) students, but need to be aware of the legal parameters governing public education of ELs. The greater flexibility afforded to charter schools offers opportunity to develop innovative approaches to providing ELs, one of the fastest growing demographic groups among students in the United States, with a quality education. But as charter schools are still subject to all federal and some state education laws, charter schools must understand their legal obligations to EL students. This report, co-authored by Safal Partners and Public Impact for the National Charter School Resource Center, examines federal requirements under civil rights laws and the Elementary and Secondary Education Act, and state laws governing charter school recruitment, retention, enrollment of EL students and their accountability for EL student performance; requirements and current challenges related to EL data reporting; and whether existing laws are adequate to address the needs of this growing population of ELs in charter schools. Several new schools are breaking with tradition so that they can deliver a more personalized experience to students. But in order to do this, they need certain autonomies, especially with respect to the ways they can use time, talent, and technology. Since the public charter sector is uniquely positioned to provide many of these autonomies, it may offer a particularly welcoming space for these “next generation” learning models. 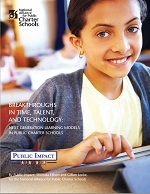 This issue brief, written for the National Alliance for Public Charter Schools, explores the ways that next generation learning models use time, talent, and technology, the autonomies they require, and how the autonomies in the public charter movement can align with what next generation models need to be successful. 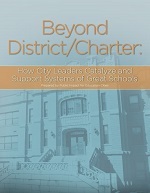 It also includes brief case studies of four promising next generation models in public charter schools. All schools present significant challenges for states and other entities charged with holding them accountable for their effects on student learning outcomes. However, virtual schools—full-time schools that provide most, if not all, instruction online—raise unique challenges and opportunities for accountability. This report, written for the National Charter School Resource Center, presents five recommendations, with multiple means to implement each, for facing the challenges of adequately assessing virtual schools.